Caption: Astrophotographer Lovro Dujnić caught a close-up of the supermoon taken in Zagreb, Croatia, on Sept. 8, 2014. Another supermoon will occur on Feb. 19, but it will be invisible to skywatchers. On Feb. 19, the moon will be at its closest point to Earth in orbit — but unfortunately, this "supermoon" will be too close to the sun to be visible to skywatchers on the ground. The moon will arrive at an extreme perigee (the closest point to Earth) on Feb. 19. 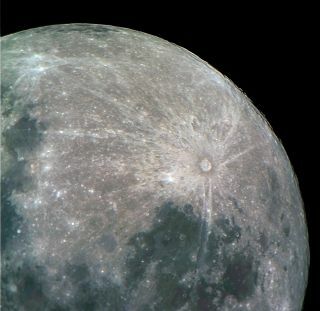 At 2 a.m. EST (0700 GMT), the moon will be 221,826 miles (356,994 kilometers) from Earth. At some point, you may have asked yourself the philosophical question,"If a tree falls in a forest and no one is around to hear it, does it still make a sound?" To that end, if the moon is unusually close to the Earth but nobody can see it, does it have any effect on our planet?" Indeed, it does! In recent years, the mainstream media, in particular, love to play up occurrences of the full moon coinciding (or very nearly so) with perigee, the point in orbit where the moon lies closest to the Earth. The effect causes the moon to loom larger than normal in our sky, appear somewhat brighter than normal and produce unusually large tides. In recent years, this occurrence has been branded as a "supermoon," causing flocks of people to run outside to gawk at the sight of the full moon (even though the changes in size and brightness are not very discernable unless you're looking for them). You might want to mark Sept. 27 on your calendar — that's when the next visible supermoon will occur. But in addition, that full moon will undergo a total eclipse that will be visible across all of North America. On Feb. 19, the moon will arrive at an extreme perigee. In fact, at 2 a.m. EST (0700 GMT), the moon will be 221,826 miles (356,994 kilometers) from Earth. That's only 73 miles (117 km) farther than the vaunted supermoon coming next September. But there is a good reason why there has been no mention in the mainstream media of the supermoon on Feb. 19: You won't be able to see it. That's because it will be a new moon. It will be too near to the sun to be seen, so it will be invisible as it passes across our daytime sky. Because the supermoon in February will be a new moon, the Earth, moon and sun will be stretched out in space more or less in a straight line. This alignment will result in what are called "spring tides," which occur when the pull of the sun combines with the pull of the moon to produce tides that are higher than normal. (The sun exerts a little less than half of the tidal force of the moon.) "Neap tides," on the other hand, occur when the moon is at first or last quarter and works at cross purposes with the sun. At those times, tides are weak. Spring tides occur about twice a month near the times of new and full moons. The term "spring tide" has nothing to do with the spring season; it's derived from the German word entspringen, which means "to rise" when referencing a body of water. The spring tides will have an unusually large range with this month's new moon: High tides will be noticeably higher than normal, and low tides will be lower than normal. This happens because the occurrence of perigee will come just more than 7 hours after the moment of new moon. And because tidal force varies as the inverse cube of an object's distance, this month's new moon will be 12.2 percent closer at perigee than the full moon of March 5, which will nearly coincide with apogee, its farthest point from Earth. Therefore, the February new moon will exert more than 42 percent more tidal force during the spring tides of Feb. 19 than during the spring tides accompanying the full moon two weeks later. So even if you can't see the "super" new moon, if you live near a seacoast, you may take note of the unusually large range in the tides on, or in the few days following, Feb. 19. You want to consult a tide table to find out the times when the tides are expected to be at their highest levels. Ship captains use tide tables just as railroad passengers use timetables. But tide tables are far more dependable, for the tide times never change their regular cycle. For as an old proverb says, "Time and tide wait for no man." Editor's note: This story has been corrected to reflect that while the moon will be at its closest, it will not be full on Feb. 19.